Writer and journalist Sarah Murray never gave much thought to what might ultimately happen to her remains. That was until her father died. Puzzled by the choice he made for the disposal of his “organic matter”, she set off on a series of voyages to discover how death is celebrated and commemorated in different cultures. 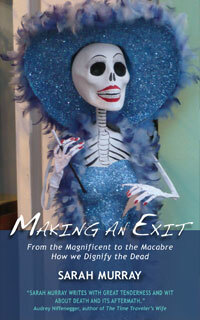 Making an Exit is Murray’s exploration of the extraordinary creativity unleashed when we seek to dignify the dead. Along the way, she encounters everything from a Balinese royal cremation, Mexico’s Day of the Dead celebrations, a Czech chandelier made from human bones, a weeping ceremony in Iran, and a Philippine village where the casketed dead are left hanging in caves. She even goes to Africa to commission her own Ghanaian coffin. Her accounts of these journeys are engaging, poignant, and funny. But this is also a very personal quest — for on her travels, Murray is seeking inspiration for her own eventual send-off. Sarah Murray is a journalist, editor, longtime Financial Times contributor and author of Moveable Feasts: The Incredible Journeys of the Things We Eat. Born in the UK, she lives in New York City.